As the home of the PGA of America, you can expect nothing less than the best at the PGA National Resort and you won’t be disappointed. The headline course is The Champion, widely regarded as one of the best tracks in America, it has hosted the Ryder Cup and PGA Championship, as well as being the home of the PGA Tour’s Honda Classic each year. The four other championship courses at the resort; The Fazio, The Squire, The Palmer and The Estate, are magnificent in their own right. Found by the Atlantic coast in Florida’s Palm Beach Gardens, the PGA National is just 90-minutes north of Miami International Airport, the perfect location for those flying in from the UK. All newly renovated and furnished, the 339 guest bedrooms and suites exude charm and sophistication, with the verdant tranquillity of South Florida on the doorstep. The PGA National Spa is almost as famous as the golf course, offering the best spa experience in Palm Beach County. If you are looking for the ultimate Florida golf resort experience, the PGA National belongs at the top of your list. The Champion Course is the backbone of PGA National's outstanding golfing heritage, originally designed by Tom Fazio and subsequently reworked by Jack Nicklaus in 1990. A top class tournament venue, the Champion played host to the 1983 Ryder Cup matches and the 1987 PGA Championship, while it is now the annual home of the US Tour's Honda Classic. The treacherous closing holes have been dubbed ‘The Bear Trap', and are among the most difficult in the state. The annual Honda Classic sees the start of the PGA Tour's Florida swing, which is a series of three tournaments played in the sunshine state. This year, Justin Thomas came out on top to win his 8th PGA Tour victory after coming out on top in a playoff against Luke List. The Fazio Course was the first to be completed at the PGA National Resort, and was designed by Tom Fazio. The main challenge around the 6,806 yard layout comes from Fazio's strategic position of his water hazards, demanding a combination of both power and accuracy. Water comes into play on 15 holes at the Haig, which was named after the legendary Walter Hagen, an unprecedented winner in golf's early years. The Palmer Course was designed by Arnold Palmer, whose aggressive attitude towards playing the game is reflected in his creation at PGA National. The fairways are forgiving and the greens large, but with the prevalence of huge water hazards, attacking play comes with considerable risks. The best hole is the daunting par 5 last, which is a real all or nothing test. The Squire is the shortest of PGA National's layouts, and its creator Tom Fazio has described it as a ‘thinking man's golf course'. Many of the holes have dog-leg fairways, often demanding conservative club selection from the tee to find prime position. Wildlife is abundant around the Squire, whose name is derived from the nickname of the legendary Gene Sarazen, and the course is truly worthy of his legacy. The Estate Course is PGA National's fifth, and is located a couple of miles outside the boundaries of the resort. Amid the verdant Florida landscape, the Estate offers a distinctly different experience to its siblings, but is well worth visiting during your golf holiday pilgrimage to Florida. 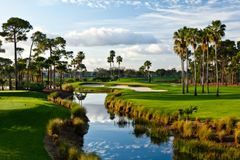 PGA National allows you to follow in the footsteps of legends - some of the game's greatest names have graced the fairways for the Ryder Cup, PGA Championship and the Honda Classic. In the prestigious Palm Beach Gardens development, the hotel's burgeoning reputation is built on the tenets of personalised service and attention to detail. For added luxury and privacy, guests can choose to upgrade to one of PGA National's Club Cottages, which are two bedroom lodges located in the serene fringes of the resort. Throughout the accommodations, the luxury touches abound, from Asian maple wood furnishings to marble and granite bathrooms, while guests will also appreciate the high speed internet access, flat screen satellite televisions, deluxe bedding and bathrobes, and the little added touches that can make such a huge difference. Total relaxation and comfort are the fundamental aims of the PGA National, allowing visitors to take full advantage of the magnificent facilities for a memorable golf holiday in Florida. Consistently ranked as the premier spa in Palm Beach County, the Spa at PGA National is an oasis of balance and wellness, and is founded upon the restorative powers of water. For the more active, the resort boasts a 33,000 sq. foot Health and Racquet Club, offering a comprehensive fitness suite, scheduled classes like pilates and yoga, 19 tennis courts, racquetball and handball courts, a lap pool and plunge pool, running tracks and whirlpools.The Bear Trap Bar & Grill is the place to convene for beers and burgers to dissect the day's golf. The best dining at the resort is found in the Tuscan-themed Sienna's, and the Ironwood Grille seafood restaurant.